Late fifties, early sixties afternoon pumps. Leopard print stenciled hair on hide and rusty brown leather. 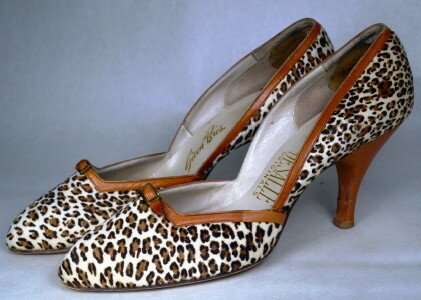 Leopard print upper with rusty brown leather edging at throat with small brass buckle center front. Rusty brown leather covered heel. Rounded point closed toe. Spike heel. Closed shank & quarter. Beige leather shoe liners. Meeeeeow! Length, measured inside foot bed from toe to heel - 10 1/2"
Very good condition. Show wear at liners and wear & repair at spike heels. Overall good and wearable condition.